XOXO WiFi is a small and easy in use mobile router, which you can put it in your pocket and enjoy private, safe and truly unlimited Internet access at nearly every place in the world. Our patented technology XOXO WiFi connects with best range local mobile operator, which will guarantee fast and trusted 3G+/4G Internet connection. You can pair router up to 5 mobile devices (smartphones, notebooks, tablets, PSP etc. ) at the same time! Our customers usually use 500MB of Internet transfer per day. With XOXO WiFi they are able to avoid high charges of having Internet access outside their home country (for Web surfing or making phone calls via WiFi Calling service or VoIP calls). 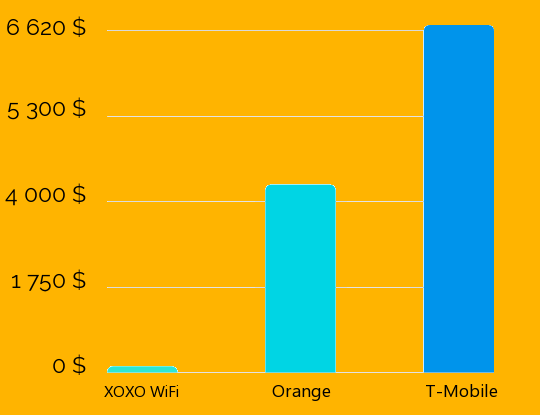 On below you can see how much you would pay for using Internet in USA with XOXO WiFi. Make worldwide phone calls through Wi-Fi signal and avoid roaming charges! With XOXO WiFi, you will be able to contact your friends by your mobile even from furthest travel destinations. How to activate Wi-Fi Calling service? Doing phone calls being thousands miles from your home and paying for it like at your home country – it’s really possible! Please check at your telecom website, how to activate Wi-Fi Calling service. Sometimes, it’s based just by downloading mobile app. Activating Wi-Fi Calling is also possible through smartphone settings. Make sure, if your mobile has enough valid OS (Android 7 or newer, iOS 9 or newer). Fill in a form about your contact details and dates of your trip. The application must be submitted no less than 2-5 days before the rental (depending on the country you choose). You can pay by Credit Card or PayPal system. Once your application has been submitted you will receive confirmation of charges. Our package will come to you from 2 to 4 days before selected in order date. Turn on XOXO with one button and enjoy the Internet connection whenever and wherever you are. Using device is very easy and clear user’s manual will help you if you will have any doubts. You will receive a addressed envelope from us, all you need to do is pack the XOXO WiFi set into it and give it to the courier.